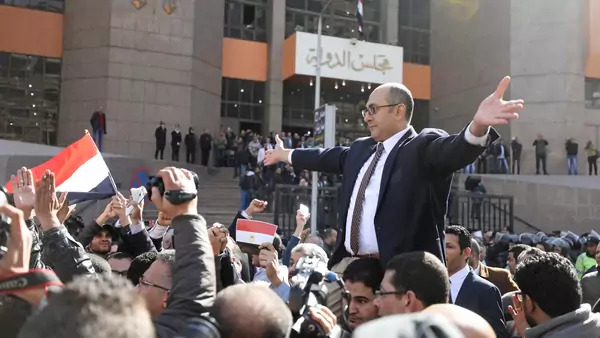 Egyptian lawyer and ex-presidential candidate Khaled Ali (center), who is marching in support of a ruling against the Egypt-Saudi border demarcation agreement, reacts in front of the State Council courthouse in Cairo (Mohamed Abdel Ghany/Reuters). This article, which I coauthored with my research associate, Amr Leheta, was originally published here on Salon.com on Sunday, July 2, 2017. On Monday, Egypt’s media outlets, government spokesmen and a large number of citizens will celebrate the country’s “second revolution.” Four years ago, Gen. Abdel Fattah al-Sisi overthrew President Mohammed Morsi — a member of the Muslim Brotherhood — after a massive popular uprising against Islamist rule. The military’s intervention was greeted with joy, the general’s popularity soared and almost overnight a cult of personality emerged around Sisi. In the Egyptian court of permissible public opinion, intellectuals, journalists, business leaders and others depicted Sisi as a hero who had saved Egypt’s nationalist identity. Today, Sisi, who has been president since his election in May 2014, finds himself in hot water with the general public. Even government-friendly polling indicates that the support he once commanded has declined. Thus far, the Sisi era has been marked by mass arrests, detention, and torture of dissidents from all across the political spectrum; numerous horrific attacks on Coptic Christians; security lapses that resulted in civilian, police, and military deaths; and a deteriorating economic situation. These conditions have produced criticism, but Sisi’s repression and Egypt’s instability have meant there is no sustained public outcry. Instead, it’s the Egyptian government’s plan to transfer two tiny Red Sea islands called Tiran and Sanafir to Saudi Arabia that has galvanized widespread and persistent opposition. This is because as bad as things have gotten for Sisi’s critics and political dissidents, many Egyptians do not share their concerns. Land is different, however. It is an issue that is bound up in Egyptians’ collective sense of dignity and historical trauma. The trouble started in April 2016 when Sisi and the Saudi monarch, King Salman bin Abdulaziz Al Saud, signed a new maritime border agreement that formally established the boundary between the two countries in the Gulf of Aqaba and the Strait of Tiran. Included in the deal was a provision to transfer — or to transfer back, some would argue — sovereignty of Tiran and Sanafir to Saudi Arabia. Almost immediately, demonstrations erupted in Cairo’s Tahrir Square and elsewhere, and the government responded with arrests. The show of force has not deterred people, though. In the 14 months since the deal was signed, ordinary Egyptians, lawyers, historians, public figures and media personalities have protested the islands’ transfer as unpatriotic and illegal. A few weeks ago, on June 14, Egypt’s House of Representatives approved the deeply unpopular agreement. Sisi ratified it 10 days later. Defiant representatives in the legislature insisted that the islands are Egyptian, but could do little more than vocally register their dissent. Public response has been nothing short of vitriolic. Not long after the vote, Egyptian social media quickly filled with angry accusations of high treason. Almost half of Egyptians recently polled — 47 percent — believe the islands belong to Egypt, while only 11 percent support the Saudi territorial claim (the remaining 42 percent are unsure). In response to the outrage, Sisi and his cabinet have argued that the islands were never formally Egyptian lands in the first place. The historical record seems to give their case some weight. The government cites the fact that the Egyptian military only occupied Tiran and Sanafir in January 1950 at the behest of the Saudi king, who felt the Egyptians could better defend them against Israel. The tension between Sisi’s government and those who oppose the transfer of Tiran and Sanafir is rooted in the values of the modern Egyptian nation-state. In the late 19th and early 20th century, nationalist historians, politicians, artists and activists weaved a compelling narrative of a common history and destiny for the inhabitants of the land of Egypt. The peasant who tilled the same fields on the banks of the Nile for centuries became a symbol of that nationalist sentiment. After the Free Officers came to power in a coup in 1952, propagandists elevated the honorable soldier protecting Egypt’s borders into another nationalist icon. Gamal Abdel Nasser, first among equals within the ruling junta, packaged those values and worked to embed them in the country’s political culture. As such, the transfer of Tiran and Sanafir to Saudi Arabia is, for many, a bewildering betrayal of Egyptian nationalism’s central axiom — that Egyptian land is sacred and intimately tied to the nation’s pride. With the deal over the islands, Sisi, who has consciously sought to cultivate the idea that he represents the rightful legacy of the Free Officers, has done the opposite of what Nasser did when he nationalized the Suez Canal in July 1956. In the process, Nasser declared that Egypt’s resources would be used for the benefit of Egyptians, effectively sealing his status as a nationalist hero. When Sisi came to power, he rested the legitimacy of the military’s intervention in large part on promises to protect and preserve Egypt’s identity and territorial integrity. During Morsi’s year-long tenure, he and the Muslim Brotherhood were said to have compromised those central values in alleged deals to sell off parts of the Canal Zone. The tables have now been turned. Instead of Nasser, opponents of the islands’ transfer liken Sisi to the folkloric character of Awwad, who “sold his land” to appease his new wife but ultimately brought shame on his family. That the maritime agreement’s signing took place a day after a summit between Sisi and King Salman in which contracts and investment deals worth $22 billion were reached — including an agreement to build a Saudi-Egyptian causeway that would traverse Tiran — only helped facilitate the comparison. The deal also tapped into nationalist traumas of the past and present. In Egypt’s official narrative, Nasser was the first Egyptian to govern and defend Egyptian land since the pharaohs. That cemented sovereignty over one’s territory as a marker of national dignity in the popular imagination. In June 1967, Egypt lost a large part of its territory to Israel in the first three days of the Six-Day War. It was not until 1982 that Egyptians could claim the Sinai Peninsula had been liberated. It was a jubilant moment, tempered by the fact that the terms of the peace treaty between Egypt and Israel limits Egyptian sovereignty over its own territory. Now there is the Tiran and Sanafir transfer, which is primarily about land but, in an additional layer of complexity, also raises the issue of Egypt’s place in the modern Middle East. Egyptians tend to imagine their country in Middle Kingdom–like terms, but reality has been crueler. For all of its attributes as the inheritor of a great civilization, the largest Arab country (by population) and, at one time, the social cultural, and political bellwether of the Middle East, Egypt is a poor country, long dependent on the goodwill of others and unable to project power outside its borders. The islands episode is all too reminiscent of Nasser’s post-1967 cap-in-hand visit to the Saudi capital, Riyadh, to ask his rival, King Faisal, for much-needed economic assistance. It signaled then, as it does now to opponents of the islands’ transfer, Egypt’s decline as a regional power in favor of the Saudis who, to many Egyptians, lack history and culture. That Israel approved of the transfer, in keeping with the terms of the Camp David accords, added insult to injury to those in Egypt who remain suspicious of Israel despite the peace treaty. Immediately after the new border agreement was signed in 2016, Egyptians flooded the public sphere with videos of Nasser asserting that the Gulf of Aqaba — which Egyptians, Israelis, Jordanians and Saudis share — belongs to Egypt, maps from various time periods that attribute Tiran and Sanafir to Egypt, scans of state-approved school textbooks teaching generations of children that the islands are Egyptian because Egyptian soldiers died defending them, and excerpts from books and manuscripts detailing Egyptian activity on those islands since the days of the pharaohs. Tiran also features prominently in nationalist stories about the Arab-Israeli wars, when Nasser blocked the strait to Israeli shipping in both 1956 and 1967. In other words, given that the state has spent decades telling its people that Tiran and Sanafir are integral parts of Egypt’s land and history, citizens were caught blindsided when they were suddenly told that the islands were actually Saudi and would be handed back. The predictable result was outrage. The January 2011 uprising that ended Hosni Mubarak’s presidency was a moment of empowerment for many Egyptians who looked forward to a new era in which their demands for bread, freedom and social justice — which, taken together, promised dignity — would be met. It did not work out as they had hoped. In Sisi’s Egypt, the patterns of politics and authoritarian pathologies are familiar. As in the Mubarak era, there remains a significant gap between what the government is telling Egyptians and what their objective reality actually is. Nowhere is this clearer than in the Tiran and Sanafir episode, where a leader who came to power promising to ensure Egypt’s nationalist pride stands accused of ignominiously handing over Egyptian territory for the most craven of reasons — Saudi Arabia’s money. The islands, which few Egyptians ever thought about before 2016, are now a potent symbol of Egypt’s terminal weakness.